Rourke: The following information is related to the post – Homemade Portable Solar Generator. Batteries B1 through Bn are connected in parallel. Connect charge positive lead to B1 positive terminal; connect load positive lead to Bn positive terminal. Connect charge negative lead to Bn negative terminal; connect load negative lead to B1 negative terminal. 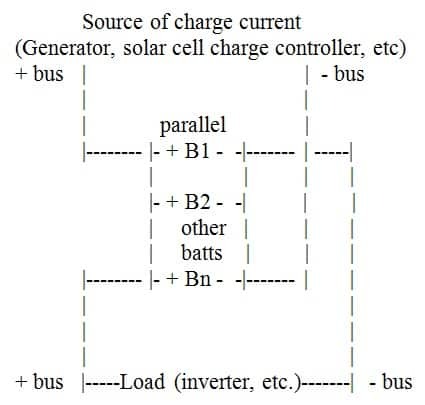 This connection scheme distributes both load and charge over the entire battery bank. Using a common negative bus and reversing appropriate charge and load connections will also work and may be advantageous if using a negative chassis ground. Weak cells or batteries will diminish functionality. Check charge of all cells regularly with hydrometer. Simply connecting the charge side to the first battery in a parallel bank and the discharge or load side to the end battery will not uniformly distribute either across the entire battery bank and will tend to charge one end of the bank and discharge from the other end of the bank (due to resistance of parallel connection wiring and within batteries). Always err on the heavy side when selecting bus wiring gauge. Clean battery terminals and connectors with a terminal brush before connecting. Lead acid storage batteries produce hydrogen and oxygen. Such out gassing creates an highly explosive mixture of gasses. Vent well and avoid creating electrical sparks (relays and switches may spark when making/breaking connection as will connecting terminals). When concentrated in the presence of a spark or flame, these gasses will cause a battery to violently explode forcefully expelling pieces of the battery and sulfuric acid electrolyte. Wear eye protection whenever working around or with storage batteries. A baking soda and water solution will buffer (neutralize) spilled or splashed electrolyte. I once witnessed the explosion of a storage battery in an automobile. There was not a scrap of battery to be found afterward and the explosion was such that the battery hold down strap was ripped from the frame and disappeared along with the battery. Word to the wise here. Panhandle Rancher, thank you for the reminder about batteries. I had one blow in a motorhome once while I was driving it because of a short that sparked under the hood. It sounded like I just ran over a roadside IUD (humor intended) and it about scared the chocolate out of me. Even though I had been taught about the dangers of a battery explosion in all of my Autoshop classes, I never knew until then how strong it could be. We currently have a debate on the type of batteries to invest in. I’m favoring saving for the more expensive solution of a bank of Trojan T105RE batteries. While my nemesis/better half suggest lower priced golf cart batteries from WallyWorld would be more economical allowing a bigger bank for the money, and replacements would be much easier to obtain. Any advice? I hate it when she cheats and uses logic on me! charging batteries is something that must require constant attention. each cell presents a different resistance to the charging device. with reduced resistance the current goes up. two probabilities. the fluid boils away causing damage to the battery and the sensing unit shuts down and the remaining batteries do not receive a full charge. daily notes of fluid level and the amount added will tell you quickly of a bad cell. removing and servicing it will insure longer life for the other cells. too many will see these alternate power supplies ans install and forget. if this is done you risk more than just a damaged battery. fire kills more people in their homes than any other problems this will be no different. we have a National Electrical Code. use it and take no shortcuts. the rules they give us are there for a reason.to keep you safe.